If any of the components are missing, please contact the IT Helpdesk to request assistance. 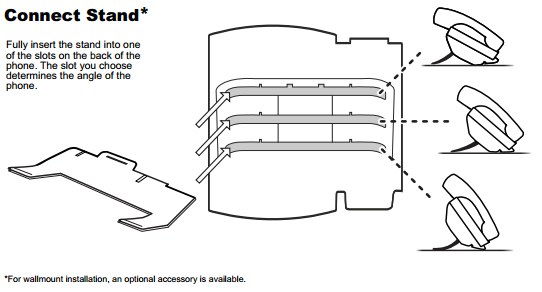 You may also find a quick assembly guide booklet in the box. Do not follow those instructions. Rather follow the steps covered in this article. Unplug the network cable from your computer and connect it to the phone’s LAN socket (as shown in step 1 above). Take the supplied black network cable and plug it into the phone’s PC socket (as shown in step 2 above). Add the ferrite clamp to this point of the cable, then plug the other end in to your computer. 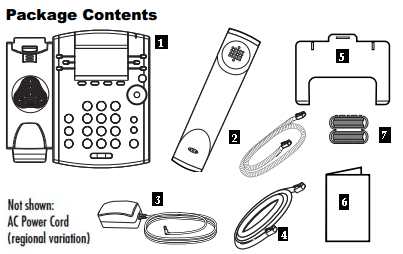 Take the supplied handset and connect the chord to the phone’s handset socket (as shown in step 3 above). 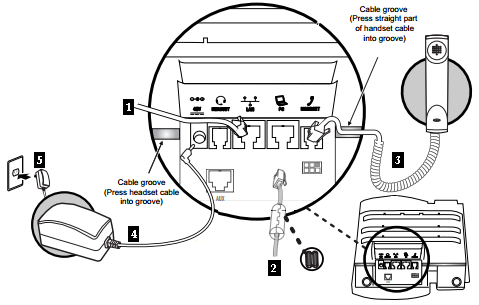 Take the supplied power adapter and connect it to the phone’s power socket (marked DC 48V – as shown in step 4 above). Switch off your wall plug, then plug the phone’s power adapter in to the wall plug. On your computer desktop, double-click Polycom BToE Connector. Select Reboot PC and click Finish. Your computer will restart. Connect the Ethernet cable from the phone’s PC port to the network port (i.e. LAN connection) on your computer. After a few seconds, the phone will display a message saying that it has successfully paired. Your phone should now be ready to use.